Stomping through the woods on a rigorous hike gets more exhilarating with each step. But are your feet as excited as you? Your feet take on the bulk of the work on hiking excursions, so it's important that they have the right padding and protection. Choosing hiking boots isn't always easy. From size to style, there is a lot to choose from, and what feels good in the store still needs time to break in before your outing. 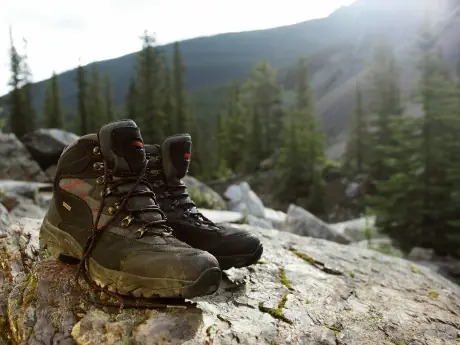 Here are five tips to help you choose the right hiking boots. Like sneakers, hiking boots are made for specific types of trekking. Are you a casual hiker or do you spend more time deep in the mountains than at home? Knowing the difference will be integral in determining which hiking boots will best suit your needs. Mountaineering boots: If you're traversing rocky territory, glacial trails or snowy paths, these are the boots for you. They're built to handle a heavy load, and can stand up against the toughest terrain. Backpacking boots: These boots are made for a variety of terrain, both on and off the trail. If you're heading out for a multi-day trek, these are the boots for you; their stiff sole and durability will help you fight through almost any conditions. When it comes to hiking boots material is of grave importance. The wrong fabric can make your feet hot, uncomfortable and cramped. Find the right material for ultimate trail comfort. Synthetics: The materials in this category are often nylon and polyester. They are easy to break in, feel light, and dry faster when wet, but are less water-resistant. Split-grain leather: Often made with half leather half synthetics, this material is still very breathable. However, it's not as water-resistant as full-grain leather. Durability is also on the lower end. Full-grain leather: Most mountaineering boots are made with full-grain leather. It's a very durable material, perfect for rigorous hikers looking to traverse unsteady terrain. On the other hand, this material is less breathable and very heavy. Low-cut: These are similar to running shoes. While they are perfect for lightweight, casual hiking, this cut leaves you vulnerable to ankle injuries. Boots in this cut are best worn on well-maintained trails. Mid-cut: This style offers more ankle support and balance, as well as better buffer from debris along the trail. High-cut: With optimal balance and ankle support, this cut is best for the adventurous hiker who is going on and off the trail, and traversing potentially dangerous terrain. It's easy to get wrapped up in the bells and whistles of a product and ignore fit all together. As you try on each pair of hiking boots, give them the size test to be sure they're the best fit for you. Thanks to natural swelling and the need to stabilize with your toes, you should have plenty of wiggle room in the toe box. The boot should fit snug around the ball of your foot while your heel stays in place. A floating heel is the main cause of blisters, which you want to avoid. Always try hiking boots on while wearing your trail socks to get an accurate feel for comfort and fit. While in the store, ask about socks, lacing techniques and insoles. All of these will contribute to the overall fit and comfort of your hiking boots. Finally, never take your shoes out of the box and head directly to the trail. Purchase your boots and wear them around your house or while running errands to break them in. This will also give you a better idea of whether or not they're the right hiking boots for you. If they aren't, return to the store to ask more questions or swap your boots for another pair.